I may have spent Valentine's Day alone this year, but it wasn't a complete loss. 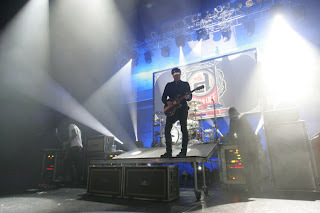 Love, Angels and Airwaves' third full-length album dropped this past weekend as a digital download. The best part - it was free. You can't go wrong there. AVA frontman Tom DeLonge told Alternative Press last week that Love "is the release of [his] life." From one listen to the record it's clear that he and his bandmates, guitarist David Kennedy, bassist Matt Wachter and drummer Atom Willard put all they had into this record. Love follows the trail already blazed by AVA's first two albums. It's an aggressive, up-tempo experimental rock album that's packed with more hooks than a Japanese fishing boat. AVA had the loop stations on full swing again, stacking melody on top of melody to produce a vibrant record that only these space cadets could pull off. Love kicks off with an instrumental piece entitled, "Et Ducit Mundum Per Luce", which when translated from the Latin means, "And He Leads the World by Light." It's the shortest song on the album, the only one clocking in at under four minutes. From there, we're taken through a list of bass driven songs complemented by Willard's tight drumming and Kennedy's classic accenting guitar leads. "Young London" is possibly the most anthemic tune on the record. The chorus, which repeats itself four times, reads: Suit up,boys/Let's ride, it's the weekend/Get down, girls/And dance with your best friend. "Hallucinations", the first single off Love, is lyrically reminiscent of "Call To Arms", the lead track from AVA's 2007 release, I-Empire. A densely packed song, calling on a romanticized view of love and the world at large, "Hallucinations" will catch you and stay stuck in your head for days. It's clear that DeLonge hasn't forgotten his past just yet. Further down the tracklisting sits "Letters to God, Part II". No doubt a follow up, coming of age ballad, to the Boxcar Racer original. Though it may be a step in a whole new direction musically, the lyrics are just as interpretable as any from DeLonge. It's a fitting way to start the album's descent. Overall, Love is bound to satisfy any AVA fan. It's obvious the band haven't lost their sound, and have found some comfort in their writing process. If you haven't already, grab the free download of Love here. Seriously, do it. It put the band $500,000 in the hole, but they're doing it for you! "Music should be free," said DeLonge in an LA Times Interview. You can pay them back when they come to your area on tour with Say Anything this spring. I'm now not sure whether or not this put up is written by means of him as nobody else know such targeted approximately my difficulty. You are wonderful! Thank you! Hello colleagues, how is all, and what you wish for to say regarding this piece of writing, in my view its genuinely awesome for me.